Magic Bullet 3: Wouldn’t it be cool if managing our money were easy-peasy? Now I know you know this is just a pipe dream. But, oh, don’t we all really, truly want it to be easy?? Unfortunately, the area of personal finances has to be one of the classic examples of complexity. It’s the land-mine sector of our lives fraught with all kinds of emotions which are tangled up in all kinds of bad habits. Combined, these emotions and habits are the causative agents for the maxed-out credit cards, late car payments, loan defaults, and disappointing lack of savings which characterize many Americans’ financial states. It’s the part of our lives for which we’d most dearly love a magic bullet – one stupendous act that could fix our colossal financial mess – and the one for which NO magic solution exists. But you already knew that, didn’t you? that all is not lost? more than enough angst over finances. Thousands of people are figuring it out. Are you in step with these trendsetters? Then, after also deciding enough is enough, go though their next steps. Unravel the complex set of EMOTIONS that got you into this mess. Pay attention to why you buy. Unravel the complex set of HABITS that has arisen from your complex set of emotions. Pay attention to your financial habits and start breaking the nasty ones. Unravel the complex set of financial PROBLEMS that have resulted from your complex emotions and your complex habits. 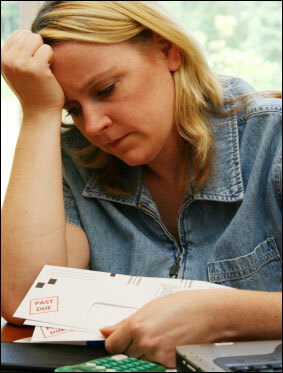 Itemize your financial problems. Do the hard thing; find the sources of the bleeding and start applying your own first aid. Some of these thousands, deciding their families are clueless (and, to be fair, they may well be), have enlisted the expertise of a professional financial counselor to guide them through their complicated financial maze. That decision can come with its own perils, so be careful. Shysters abound. Ask around. And, of course, beware of anyone selling shiny magic bullets. Check with the Better Business Bureau in your area. Really. Heard of Dave Ramsey? Talk about someone with street cred for doing it ALL wrong the first time ’round! He started a real estate empire which ended in his personal financial meltdown – a good 25 years before our nation’s 2008 financial meltdown. He paid attention to his mistakes, dug himself and his family out of the hole, and started his Financial Peace University. This thriving business makes money telling others how to deal with their money – the smart way. Thousands, including yours truly, have decided to take advantage of Ramsey’s learned-the-hard-way expertise. Guess what? People who sign up for Financial Peace soon notice that the words “magic solution” never pass Dave Ramsey’s lips. He does, however, insist on the laborious work of unraveling your financial mess SO THAT you can do something about it. After my husband and I did the hard work of paying attention to our emotions and habits, we tackled the chore of creating a better financial plan. Fortunately, I’m from a very conservative gene pool where paying interest on anything is regarded as really, really, really bad form. “We don’t pay interest; we earn it.” My husband is also from conservative financial stock. That bit of hereditary good luck meant we hadn’t gotten ourselves into debt or financial trouble. We went through the process above because we were fairly certain we could do better. And we did. Though it wasn’t a particularly hard process, it was a lengthy one. But we persevered. Slow and steady wins the race, you know. But you’ve probably heard that before, haven’t you? Hmm, I wonder where? Oh, never mind. What could Uncle Lauren possibly know about fiscal health? So. Want to get your finances in order? Swallow hard and put on the big-boy pants (or big-girl pants, as the case may be). DECIDE that you are willing to do for yourself what no one else can: get your own financial house in order. Forget the magic bullet myth. Like unicorns, they never existed – never will.